How much were cars in the Philippines in 1900s-1970s? Cars, trucks and motorcycles were introduced and made available in the country by trading companies as early as 1901. Although the US dollar was equivalent to two Philippine silver pesos during that period, the price of a motorized vehicle was considered a very large sum to carry around. On a daily basis, the average Filipino lived on centavos only. 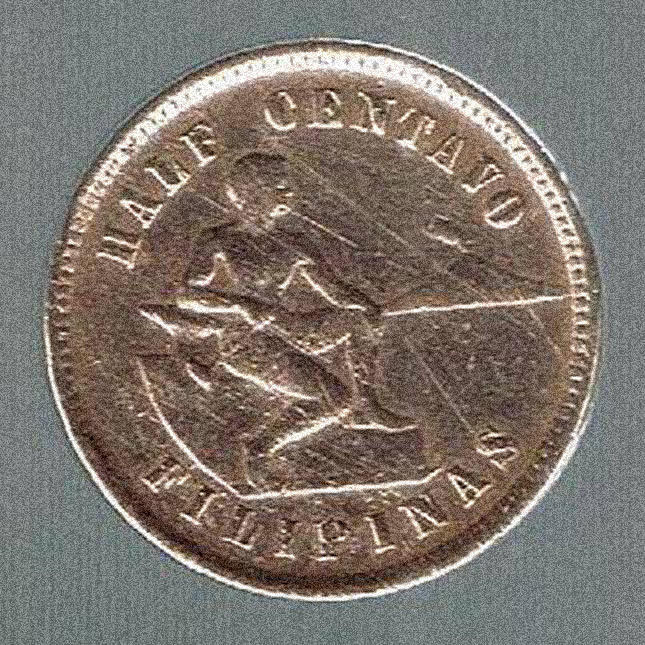 Taking into consideration the high purchasing power of a one-centavo coin, half-centavo coins were eventually minted in 1903 as additional currency. Wealthy citizens were initially the ones who could afford to buy and own the newly introduced motorized carriages. Expatriates also bought cars for their personal use while staying in the country. 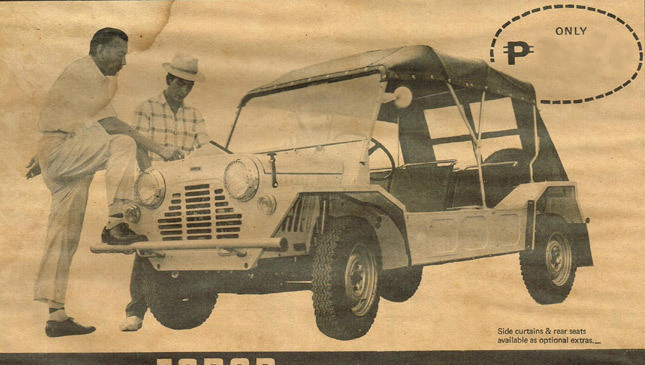 Likewise, traders, Filipinos doctors, lawyers, architects and engineers also acquired these cumbersome rolling vehicles. According to a 1910 motor car directory, Dr. Juan Miciano was acknowledged to be the first Filipino to buy and operate a car. He bought a French car—a Richard-Brasier—in 1901. He and a colleague performed the first local laparotomy operation in 1900. Don Benito Legarda, another prominent personality during that time, bought a Renault in 1904. 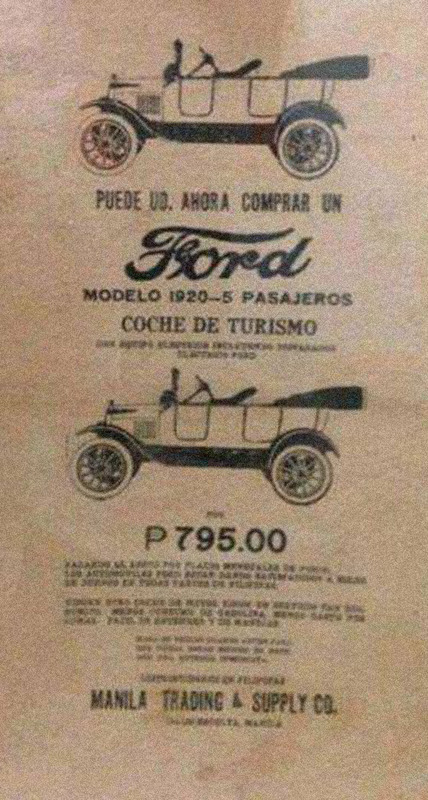 Researchers, including myself, are still clueless about the prices of cars sold in 1910 and earlier. It was only in 1911 when dealers started to include retail prices of cars advertised in periodicals. 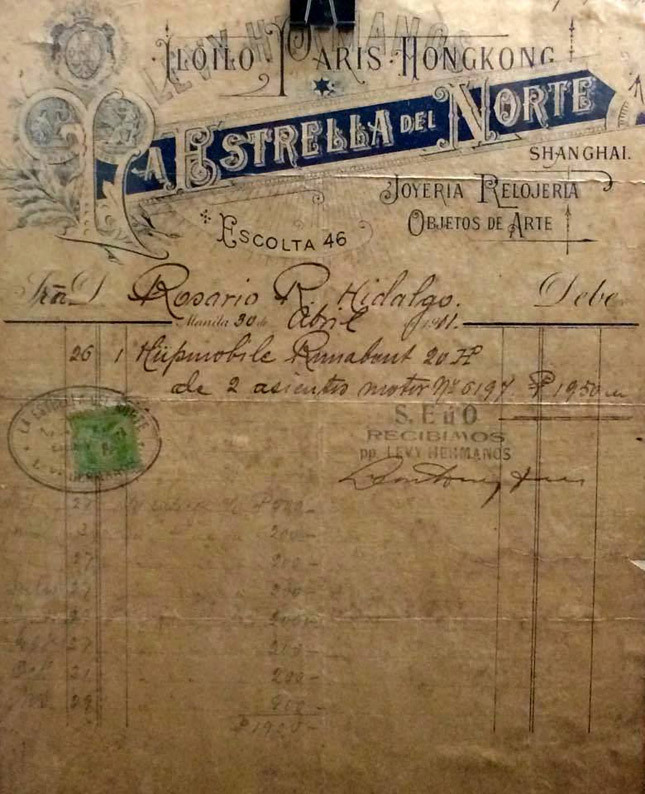 A certain Señora Rosario R. Hidalgo acquired a brand-new Hupmobile Runabout for about P1,900 (around $975) from La Estrella del Norte in 1911. 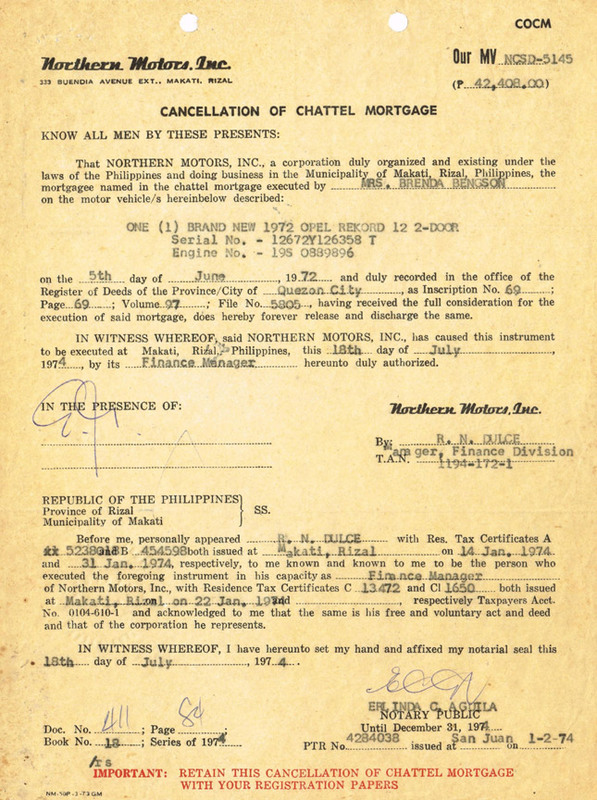 The Chandler and the Studebaker cars were advertised and priced at P3,800 and P3,200, respectively, in 1912. The most expensive unit at the time was the 1912 Thomas Flyer car. Winner of the 1908 New York to Paris Race, the Thomas Flyer model was pegged at P8,000. Such an amount was more than enough to pay for a large hacienda beyond the city limits of Manila. As more low-end vehicles became available in the market, car prices drastically decreased in the 1920s. A unit could be had for less than a thousand pesos. A 1920 Ford Phaeton, a four-door sedan with a canvas top, was priced at P795 and was considered a bargain. Cars assembled with steel roofs were priced higher. The Austin sedan, another low-end car, was advertised as a P1,500-worth unit by 1935. 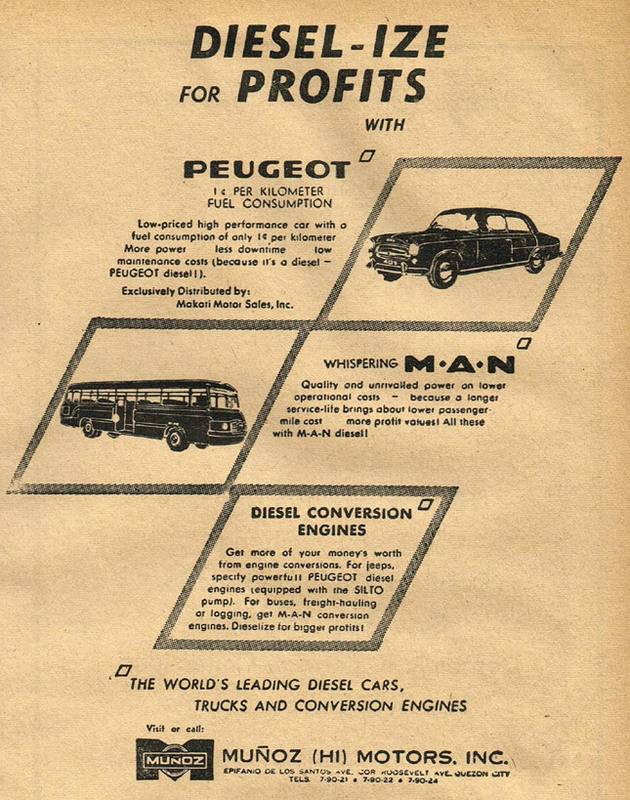 To date, no data has been unearthed about automotive prices from the 1940s to the mid-1950s. But with no US dollar to Philippine peso exchange rate increase, one could deduce that prices of domestically available cars likely ranged from P2,000 to P10,000. With barely any inflation, the minimum wage for blue-collar workers remained at P4 a day. Young professionals like teachers and graphic artists received monthly salaries ranging from P200 to P300. The minimum public transportation fare was still at 10 centavos and a kilogram of pork meat was around P1.00. The first increase in exchange rates between the peso and the dollar came in the early '60s. While the 50% increase in exchange rate somehow dented the buying power of the peso, the automotive industry grew beyond expectation. The revival of trade with Germany and Japan brought in additional brands unknown during the pre-war period. 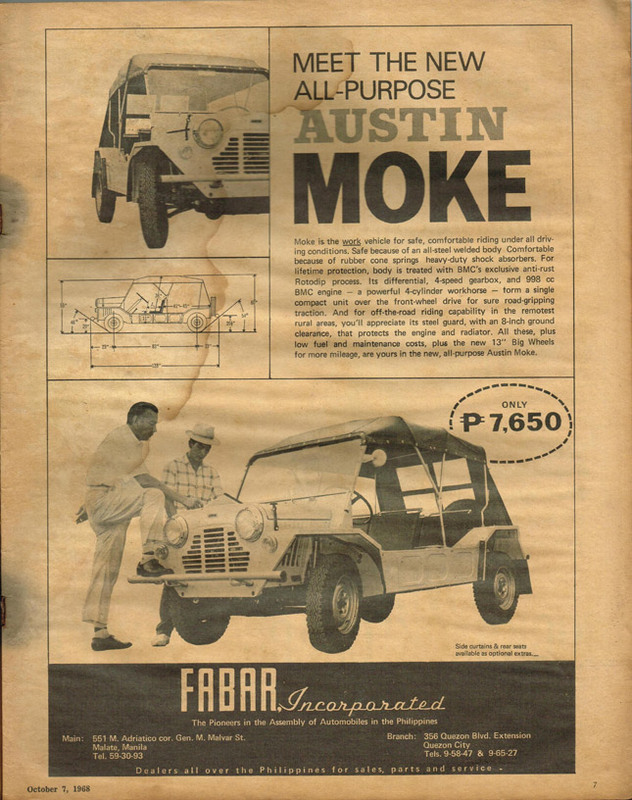 In the mid-'60s, more than 20 car assembly plants were in operation or were being built all over Manila and Rizal. 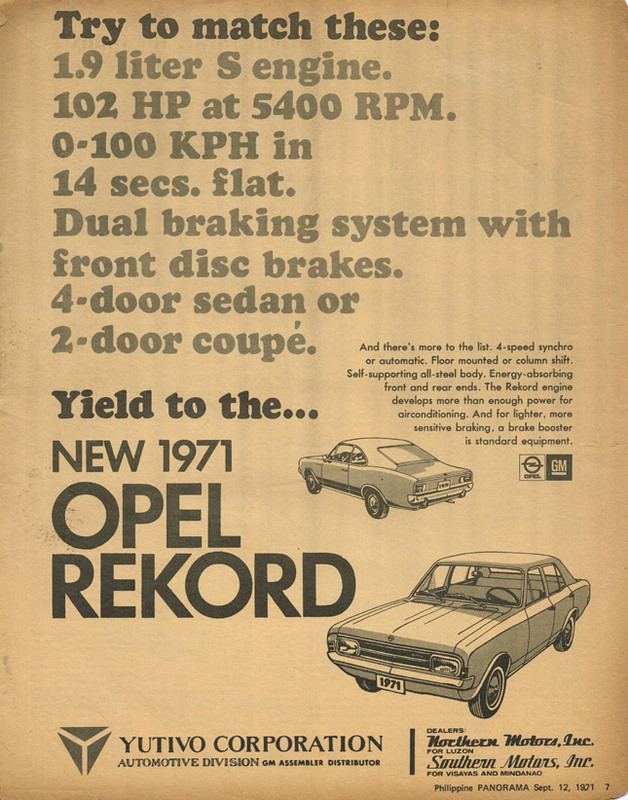 As the decade ended, buyers could choose from 14 European brands (Austin, Citroen, Fiat, UK-derived Fords [Consul and Taunus], Hillman, MG, Mercedes-Benz, Morris, Opel, Renault, Standard, Simca, Vauxhall, and Volkswagen); eight American brands (Rambler American, Buick, Chevrolet, Dodge, Ford, Oldsmobile, Plymouth, and Pontiac); seven Japanese brands/models (Datsun Bluebird, Hino Contessa, Honda 600, Isuzu Bellett, Mazda 800, Nissan Cedric, and Toyota Corolla); and a lone Australian car (Holden) in bantam, light and heavy categories. All were priced based on categories and name brands. From the list, one can compare car pricing differences based on vehicle weight, engine displacement, and load capacity. Most American cars on the list were considered to be part of the high-end bracket then. When the Progressive Car Manufacturing Program was initiated in 1973, the number of automotive dealers and manufacturers was trimmed to seven brands: Datsun, Ford, General Motors, Mitsubishi, Renault, Toyota, and Volkswagen. Consumers could still select the brand to own based on their capability to buy. Automotive pricing and sales during the period were greatly affected by periodic inflations and the two major oil crises in 1973 and 1979. The exchange rate of the Philippine peso to the US dollar became seven to one, and has been rising ever since. The two crises brought about great price increases of oil-based lubricants, gasoline, and diesel fuels. The worst scenarios had the government imposing gasoline rationing and banning the operation of gas guzzlers on the road, particularly American cars with V8 engines. By the end of the decade, fuel-efficient Japanese cars had dominated the market. The political uncertainty (as a result of the Aquino assassination in 1983), the Snap Elections, the People Power Revolt in 1986, and the failed coup d'etat attempts thereafter adversely affected the economy in general, and the automotive industry in particular. Local automotive manufacturers like Ford and International Harvester eventually closed shop. As the country began to stabilize in the '90s, dealers returned anew. But that's another story to be tackled in the future. 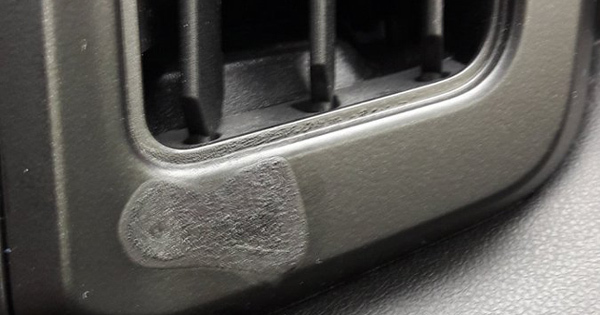 Can using car perfume damage your interior?